"My name is Barry Allen, and I'm an innocent man." On one level this episode is exactly what it appears – the next step in The Thinker's plan to sideline The Flash and carry out his dastardly machinations. On the other it is a study in contrasts as a commentary on its overarching theme of truth versus perception. Unfortunately, it doesn't spend much time on any of it. Everything seems to be coming up Thinker. He's augmented his superior intellect with the ability to read minds and has exchanged his failing body for a younger, healthier model. As an added bonus, The Thinker used the body he no longer needs as the means to imprison Barry and distract Team Flash from discovering his endgame. Not to mention he leaves my theory about needing Barry's connection to the Speed Force to heal himself in tatters. But I digress. The most obvious example of truth vs. perception is the murder itself. Barry could not have murdered Clifford DeVoe because he's still alive despite the body found in Barry's home. And while the prosecution's narrative that Barry used his position with the CCPD to harass DeVoe may be true, the perception of DeVoe as a harmless professor is patently false. 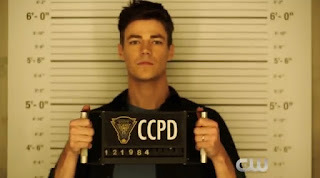 However, Barry's six-month absence and flagrant tardiness in addition to the more concrete evidence of Barry's fingerprints on the murder weapon and his DNA under DeVoe's nails feed into the jury's perception of Barry Allen as an unrepentant murderer instead of the selfless public servant he is in reality. I'll leave it to others to argue the legal merits of the case. Keeping in mind that the goal was to place Barry in prison as fast as possible, I found the trial to be an improvement over most of the others held in the Arrow-verse. At least the evidence presented against Barry was compelling even if it was mostly circumstantial. Besides, if you were watching The Flash for its legal acumen, you were bound to be disappointed. Both Joe and Ralph, officers sworn to uphold the law, were faced with the knowledge that someone was about to get away with murder (DeVoe may not be dead, but Dominic Lanse most certainly is). The temptation to break the law in the pursuit of justice is overwhelming. Joe is a father desperate to protect his son as well as well as a cop whose sense of right and wrong is being violated. Dibny understands the madness that taking matters into his own hands leads to. Breaking the law is never the right thing to do no matter what it feels like. As Barry says later, you become the thing you've sworn to protect people from. I have to admit this was my favorite moment. It was one of the few scenes where they slowed the frenetic pace of the show and let it breathe. What's more, Dibny's speech to Joe did more to humanize and redeem him than any of the heroics we've seen him perform. This left Cisco, Harry, and Caitlin to deal (unsuccessfully) with Fallout, the meta of the week. I'm assuming that Fallout is one of our twelve Bus Metas since he seems to have acquired his abilities quite recently. Have we ever had a meta that didn't know he was causing a disturbance before? Not only does Fallout not have a clue, he has no idea how to control his ability once he becomes aware. Considering that he is the equivalent of a nuclear bomb this is a problem. It is also a problem that his primary purpose seems to serve as an excuse for one last demonstration of the episode's theme. Barry walks out of his own trial to save the city leaving the jury with the belief that the trial means little to him. In case you weren't sure we have the montage in which the judge denigrates Barry and sentences him to life without the possibility of parole while Singh praises The Flash and presents him with an Award of Valor just for emphasis. The problem is in spite of any pleasure derived from the episode's structural symmetry, it asks more questions than it answers. We understand that Barry will act selflessly even if it means his imprisonment. Just as we know that DeVoe's sacrifice of an innocent man to obtain his goals is proof of his inherent selfishness. We're witness to the perception of wrongdoing triumphing over the reality of good at every turn. However, the speed at which we move through Barry's arrest, his trial, and subsequent sentencing does not allow us to draw any conclusions. Maybe I'm being too harsh. This is such a blatant set up for future episodes that it probably should not be judged on its own merits. My argument is that this should not be the case. With 13 episodes left in the season, I'm finding it hard to believe they couldn't have spent their time more judiciously if you'll pardon the pun. If they had spread this story over two episodes, they would have had time to show the effect being so completely outwitted had on Team Flash. They would also have had the opportunity to show the toll this had on Joe rather than giving us a couple of expository scenes. Most importantly, we could address the emotional impact being wrongfully accused had on Barry instead of him merely putting on a brave face. I won't slam this episode for not being Law & Order, but it doesn't get a gold star for the speed at which it sent Barry Allen to prison at the expense of character and plot either. They brought up the weird things Barry was spouting when he first came out of the Speed Force, but we're still no closer to finding out what any of it means. They've been mirroring Clifford and Marlize's relationship with Barry and Iris all season, to the point where they are now showing the couples in back to back scenes with almost identical staging. That coupled with the showdown between Marlize and Iris makes me believe this has to play into the finale. As a crime scene tech, you would think that Barry would be a little more adept at covering up a murder if he had actually killed DeVoe. The possibility of nuclear fallout can't bring out Killer Frost but puppies can? Huh? Why did Cisco have to send the radiation to Earth 15 and how sure are we that it was indeed a dead planet? Why couldn't he just have vibed it into space? Notice how I'm not mentioning the sun's radiation travels through the vacuum of space and therefore Barry's OMG Science should not have saved the day? Barry being placed in his father's cell. Need I say more? Iris: "They say that the first year of marriage is always the hardest, but I never thought my husband being on trial for murder would be one of the challenges." Slater: "I need you to believe in the impossible." Singh: "Well, vintage Central City. Meaning another weird one." Singh: "Everyone always talks about going after the criminal, the guilty. But Allen said he wanted to help the victims. The Innocents." Dibny: "I'm very good at reading body language. Right now, you're tense. Now, you're annoyed." Caitlin: "They all suffered from fatigue, vomiting, abdominal pain, skin rashes." Cisco: "So everyone ate a bad burrito?" Cisco: "Still no word from the courthouse." Caitlin: "That's good news, right? No news is good news." Harry: "Good news is good news. No news is miscommunication." Barry: "If everyone knew my secret we would never stop running." Iris: "I would rather run forever with you than stand alone without you." Dibny: "If there was an award for best crocodile tears, by the most emotionally manipulative widow, Marlize, definitely in the top three." Fallout: "What is going on?" Juror: "We, the jury, find the defendant, Bartholomew Henry Allen, guilty of murder in the first degree." Devoe: "Have a nice life, Mr. Allen." An excellent review, Shari. Thanks so much for taking the Flash for us. I thought this episode was a bit depressing. We know he won't be in jail forever because he's our hero, so it feels like they're spinning their wheels. I particularly wanted to see Barry get on the stand and testify that he was innocent because he's the Flash but of course, that will never happen. I also really hated seeing him arrive in his father's cell. My favorite fun moment was Cisco enraging Caitlin into turning into Killer Frost with "the puppies are going down!" Silly, but fun.